Medicinal uses: Dried roots used to treat gastrointestinal ailments. Root and leaf extracts are used to treat eczema, psoriasis, acne, skin infection, slow-healing wounds, dermatitis, itches, insect bites, and other ailments. Fresh root can be added to stir-fries and soups. Used as an alterative this plant cleanses the blood by cleansing and detoxifying the eliminative organs (Chevallier 65). 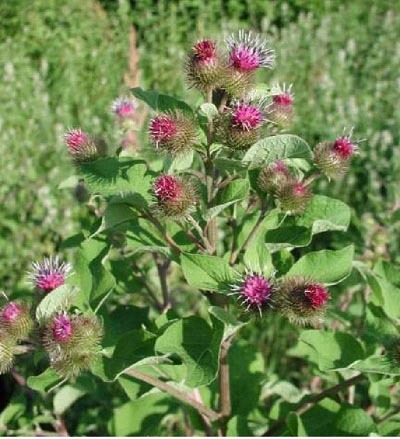 Additional uses: Burdock makes an exceptional addition to many foods. The root can be stir-fried, simmered in soups and stews, steamed, or sautéed. Spring leaves of first year plants can be served raw or prepared like spinach (Kowalchik 58-9). Cautions: None known (Chevallier 65).